"Jovian Antarctica" as captured by NASA's Juno spacecraft during a flyby Feb. 2. The image was taken when Juno was 47,600 miles (76,600 km) away from the planet. NASA's Juno spacecraft caught this mesmerizing image of cyclones on Jupiter's south pole during a close flyby on Thursday, Feb. 2 — one specific "point of interest" that the public voted for. The image was taken 47,600 miles (76,600 kilometers) above Jupiter. 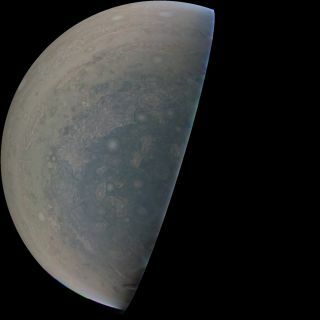 During the flyby, Jupiter approached much closer: to within 2,670 miles (4,300 km) of the planet's cloud tops, NASA officials said in a statement. Juno imaged 10 particular user-selected locations over the course of the flyby (plus five supplementary locations), which were sorted by the number of votes each location received. "Jovian Antarctica" was the final spot that made the short list. Voting for locations during the next flyby, which is scheduled for March 27, will begin March 10. The photo, taken by the JunoCam instrument, reveals multiple cyclones on the planet's south pole and oval storms out near the edge of the visible planet. Juno gathered data about the planet with all eight of its instruments, including an aurora mapper, JIRAM. Besides choosing target locations, citizen scientists have been downloading and processing raw images of Jupiter that have been taken by JunoCam, whether the goal is scientific analysisor just wild artistic expression. Juno is currently orbiting Jupiter every 53.5 days — and with every close flyby, it gathers more information about the gas giant's gravitational and magnetic fields, atmosphere, weather and composition.